With these cute little steamed cupcakes, I continue my around the World baking trip, which I started without any intention, but never the less enjoy enormously. I have recently been to Sweden, Israel, Mexico and Austria, and today I am bringing a taste of Japan. There are so many ways to combine and decorate them, but I liked the dotted version best. Makes 10 to 12 cupcakes, depends on a cupcake case size. If you have a steamer, heat it up, if not put some water into a wide, saucepan with lid and bring it to boil. You will also need few heatproof ramekins, lined with cupcake cases. I used 4 ramekins and made 11 cupcakes in 3 batches. Beat eggs and sugar vigorously until fluffy and doubled in size, then add milk and dry ingredients, except the cocoa powder;combine to get smooth batter, then divide into two equal parts. Add cocoa powder (or any food colour of your choice), then pour both batters into piping bags. 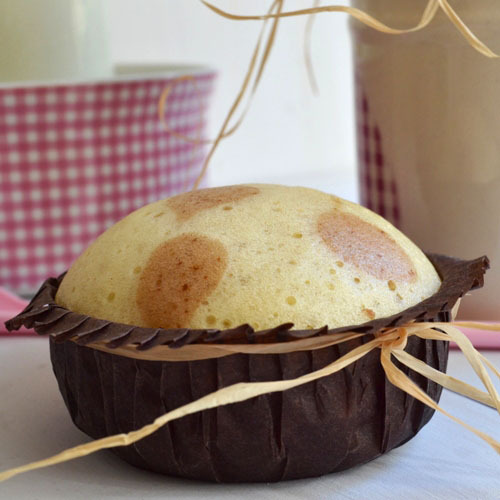 Pipe some batter into a cupcake case (1/3 capacity), top it with a teaspoon of jam, then cover with more batter (3/4 capacity). 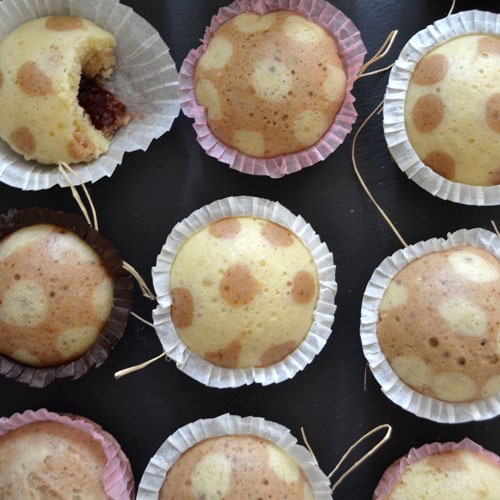 Make dots with the opposite coloured batter. Place the ramekins in the saucepan with boiling water, then bring the heat down. Steam for 9 to 11 minutes over medium temperature. A toothpick should come out clean when they are done. Take them out of the ramekins and and let them cool. repeat the process until all the batter is used.